It might have been tough for Toronto Raptors fans to watch Thursday night’s game against the San Antonio Spurs, but it couldn’t have been as hard as it was for Kawhi Leonard’s mom, Kim Leonard. In the first meeting between the Spurs and Raptors since last summer’s blockbuster trade, Leonard’s team was blown out of the building with a 125-107 loss in a game that wasn’t ever close. Despite helping to lead the Spurs to an NBA championship in 2014, many fans in San Antonio were still upset that he wanted out of town. A loud chorus of boos was expected to greet Leonard upon his return, and it did. In fact, there were plenty of boos every time Leonard touched the ball, and clearly his biggest fan had had enough. 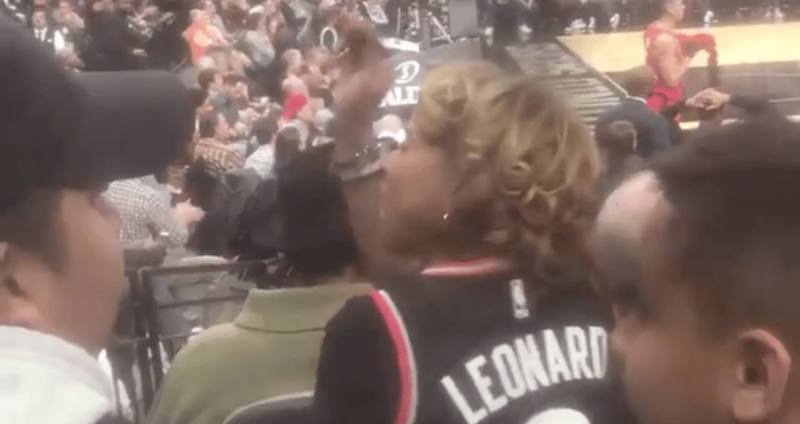 A fan sitting behind Mama Leonard captured the moment she stood up against a heckler, calling him an “as*hole” and telling him to “shut up.” The video has since gone viral, and has been viewed almost a million times through several tweets. The Raptors and Spurs will meet for one final time this year on February 22 in Toronto. With files from Rob Williams and Reuben Dongalen Jr.